A predicted shortfall of 250,000 staff by 2030 could be a major risk to the NHS Long Term Plan, a report by three leading health think tanks states. The briefing paper by the King’s Fund, the Health Foundation and the Nuffield Trust says one of the greatest challenges lies in nursing, with one in eight posts vacant and 36,000 nurse vacancies in the NHS in England. There are worrying increases in the number of nurses leaving the NHS, particularly at younger ages, the report The health care workforce in England: make or break? states. 5,000 more nurses left the NHS in 2016/17 than in 2011/12. 1,584 more EU nurses and health visitors left their roles in the NHS than joined between July 2017 and July 2018. The report cites the loss of the nursing bursary and the declining number of applicants to nursing courses, with the biggest fall on record – 11,750 – between 2016 and 2017. ‘The anticipated expansion in the nursing training pipeline of 10,000 additional nurses has not materialised,’ the report adds. RCN acting general secretary Donna Kinnair said: ‘If the NHS ten-year plan is to be genuinely forward-looking and more than a wish list, the nursing shortage must be addressed. 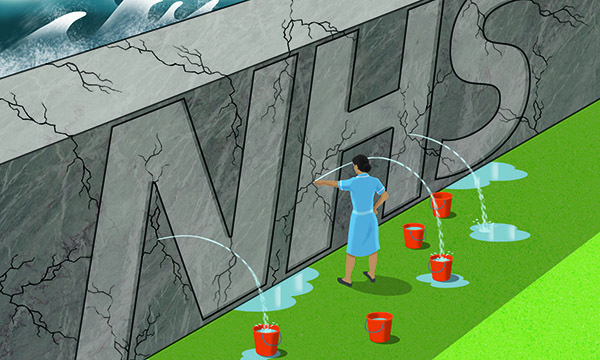 The report authors state current shortages of more than 100,000 NHS staff are caused by a number of factors, including fragmentation of responsibility for workforce issues at a national level; poor workforce planning; cuts in funding for education training places, and restrictive immigration policies exacerbated by Brexit.